Do you know OUTPUT clause? You can say wait a minute. If I want to use OUTPUT I have to declare a table variable first and then use SELECT. It is more complex than just using SCOPE_IDENTITY(). Without OUTPUT we would have to write a nasty loop! Here is one more example. Let's assume that we have an additional table that references dbo.Main. We want to insert a few rows into dbo.Main and then related rows to dbo.Child. It is quite easy if we use OUTPUT clause. Extremely useful thing that you must know! At the end it is worth mentioning that OUTPUT clause can be also used together with UPDATE, DELETE or MERGE statements. After some time I noticed that VirtualBox stopped showing 64 bit versions in the Version list. Well, it was actually good because I couldn't use a64 bit virtual machines anyway ;) But, I still didn't know why it happened. I checked BIOS settings and it seemed ok. I searched Internet for the answer but everyone were recommended to verify BIOS configuration what I've already done. I needed a new VM quickly so at that point I installed a x86 version of Windows. A few days later my colleague Przemek suggested that the problem may be in the conflict between Hyper-V and VirtualBox and that I should disable Hyper-V. It was strange because I've never installed Hyper-V. 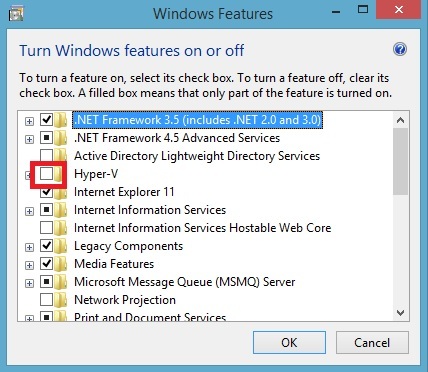 However, I checked and I discovered that Hyper-V features were enabled on my computer. It seems to me that they are installed by default with the operating system. The solution was easy. I pressed Win+S and typed Turn windows feature on or off. Then, I cleared a box next to Hyper-V and restarted computer. After that I was able to install a x64 version of a operating system on a virtual machine. Your host system is a x64 version of Windows 8.1. Virtualization is enabled in BIOS. And you cannot install x64 operating system on a virtual machine then try to disable Hyper-V. I used CancellationToken.Register method in order to register a callback that will be executed when a token is canceled. This callback is responsible for notifying TaskCompletionSource<T> that underlying task should be cancelled. 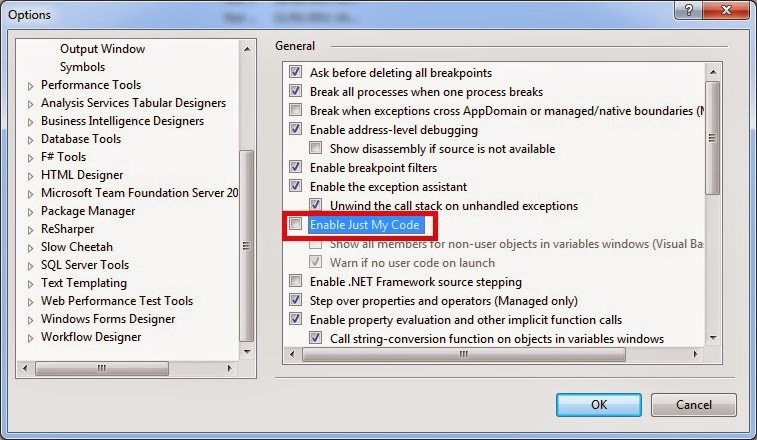 You may say that it is not enough because this code doesn't inform DropNetClient that an action should be cancelled. You are right. However, according to my knowledge DropNet API doesn't provide such a possibility. It leads to the situation when a task is cancelled but DropNetClient continues processing and finnaly TaskCompletionSource.SetResult method will be executed. This will cause ObjectDisposedException because this method cannot be executed for a disposed task. What can we do in this case? The first solution is to check if a task is cancelled before calling SetResult method. However, it can still happen that a task will be cancelled after this check but before calling SetResult method. My proposition is to use methods from TaskCompletionSource.Try* family. They don't throw exceptions for disposed tasks. I'm aware that it is not a perfect solution because it actually does not cancel processing. However, without modifying DropNet code it is not possible. It the case of my application it is an acceptable solution but it is not a rule. Recently, I've written a post about integration with Dropbox. This one is also about integration but this time with Skydrive. I spent some time on investigating how to implement this feature in a desktop application. I was even considering to write what I need from the scratch on my own. Fortunately, it turned out that someone did it for me. I found a nice piece of code prepared by Microsoft. It includes sample applications showing how to do everything step by step. You can download it from github. Recently I've found a question about real life scenarios for using rather unknown TaskCompletionSource<T> class. I started thinking where I would use it and very quickly I found a good practical example. I have a pet project LanguageTrainer that helps me in learning words in foreign languages. Some time ago I added Dropbox support to it. It allows me to export/import list of words to/from Dropbox. I developed it in synchronous way. Now I prefer an asynchronous approach and I want to take advantages of async/await keywords. The problem is that DropNet library, that makes communication with Dropbox easy, doesn't use async/await. It has asynchronous API but it is callback based. The really easy solution here is to use TaskCompletionSource<T>. Here is an example (simplified). Let's start with the original code that downloads a given file from Dropbox. The method ProcessFileAsync is marked as async and returns a task so it can be awaited. Easy. isn't it? A few lines of code and you can use async/await with other types of asynchronous APIs. This time I'd like to write about WPFLocalizationExtension library which makes localization of WPF applications easy. I've been using it for 4 years in my projects and it simply works. To be honest I've just realized that the version I'm using is considerably outdated. However, for all this time I haven't encountered problems that would make me to download a newer version of WPFLocalizationExtension. I think that it is a quite good recommendation. So, if you work with WPF and you need to localize your application I encourage to give a chance to WPFLocalizationExtension. How to solve Transportation problem in Excel? I think that most of you have heard about Transportation problem. We have N factories and M mines/producers. Each factory needs and each mine can provide particular amount of resources. We have to transport these resources from mines to factories. What is obvious it costs money and this cost depends on the distance between factories and mines. We have to find such an allocation that will minimize this cost. In order to solve this problem we can use linear programming and one of the most popular algorithms are simplex or stepping stone algorithm. However, today I will not write directly about them but I will show how to solve this problem in Excel. Yes, I'm talking about good old Excel. Surprised? 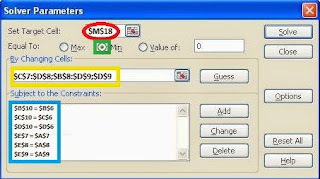 Excel has an Add-in called Solver which will do a job for us. I'll explain how to do it using a simple example with 3 factories and 3 mines. Here is a table that shows costs of transport between mines and factories. For example, if we want to move 10 units from Mine 1 to Factory 1 then a cost will be 10 *c11. We also need another table with supplies and demands. Below is an example. The numbers is the first column shows how many resources each mine can provide and the numbers in the the first row shows how many resources are needed by each factory. We also we have to define limitations and a cost function. The first limitation is that found allocations should be non negative i.e. Besides we want to allocate all resources available in mines and each factory should receive required amount of resources i.e. Because we have a column and a row with allocation sums it will be very easy to enter these allocations into Solver. It is also worth saying that in general these limitations can be different, for example we can have more resources than needed. Of course, in this case formulas above would be also different. Now we have everything to solve a problem in Excel. Firstly we have to enable Solver. To do so open Excel options, select Add-ins. Then find Solver on the list and confirm with OK (this procedure can vary in different versions of Excel). I've already prepared a spreadsheet with all required equations and data for you. You can download it here (you have to download this file locally and do not use online Excel application). 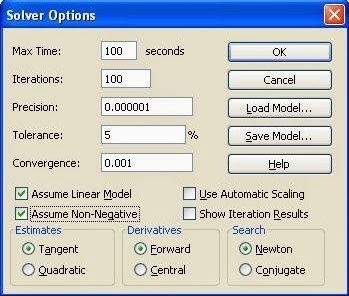 To run Solver go to Data tab and select Solver in Analysis category. Then select Solve button and all missing allocations will be populated. Easy, isn't it? Now, a few words about using Solver. Here is a screenshot with Solver Parameters. A cell in a red circle contains a cost formula. This formula will be minimized (see a green rectangle). Yellow rectangle contains cells that will be modified by an algorithm and finally blue rectangle contains six formulas explained in the previous post. 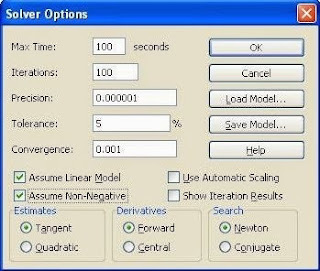 The next screenshot shows additional options of Solver. You can display this window by pressing Options button in Solver Parameters window. I want to point 2 selected options. Assume Linear Model tells Solver that it deals with linear programming problem and Assume Non-Negative tells Solver that we are interested only in non-negative results. As you can see much more options are available. I encourage you to experiment with them and also with different costs, limitations, number of mines/factories and problems. I'm working at the application which finds so called execution patterns in logs recorded by IntelliTrace historical debugger. An execution pattern is a sequence of methods calls that is widely used in the application and it is a kind of automatically generated documentation. 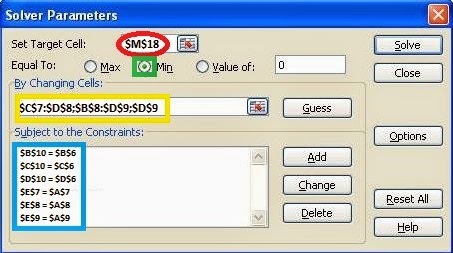 The part of the algorithm is filtering of found patterns based on criteria like the length of a pattern or the number of different methods in a pattern. At the beginning I used only 2 criteria so it was easy to handle all possible combinations of them i.e. use the first criterion, use the second criterion, use both and used none. Then I added 3rd criterion and I thought that for 3 criteria I still don't need a generic mechanism. However, shortly it turned out that I want to handle 5 criteria what gives 32 of possible combinations. This time I did it once and for all. I decided to use expression trees to dynamically build an expression that verifies any combination of criteria. The code is quite simple. Firstly we need an enum for all criteria. We also need a class that will represent patterns. The code can be made even more generic but I'll leave it as an exercise. When I finished this code I started to worry about performance. It is critical for me because my application needs to process large amount of patterns efficiently. I made the following simple test in which dynamically generated and static functions are executed 1 million times. Dynamically generated predicates are 2-3 times slower than static ones. However, we are still talking here about dozens of milliseconds in order to make 1 million calls. For me it is acceptable. The developer's work very often involves effective re-using of a code that was written by someone else. Sometime these are fully fledged libraries or frameworks but sometimes these are also small or even very small pieces of code found on a blog or a forum. All this stuff makes our life easier. When I use someone else's code in my project I wonder if it is worth writing about it on my blog. And sometimes I hesitate. Why? Because it is a well know library and there is a lot about it in Internet. Sometimes because I don't have time to write a tutorial. And sometimes because I think that there is no much to write about,that it is a small piece of code so everybody can understand it on their own. Now, I think that it is a wrong approach. Maybe it is small, but I used it so it means that I din't have to design, write and test it on my own. Maybe I don't have time to write a tutorial but this code actually saved me time that I'm lacking. So, what should I (we) do? Just write a short note on our blogs and say that we used this and this in our projects. At least in this way we can thank the authors. To start. In WPF there is a class GridSplitter that allows user to resize rows and columns in a grid. However, I wanted the same functionality for DockPanel but WPF doesn't provide it. I decided that I'll wrote it but firstly I goggled for something like that and I found this article. The DockPanelSplitter class has 300 lines of code, it is not complex but works well. Give it a chance. Some time ago I had an occasion to read about security tips and tricks for C/C++. I don't use C/C++ in my day to day work however it was interesting. I also started looking for information if these recommendations apply to .NET and thanks to that I learned a few new things. ASLR (Address Space Layout Randomization) is a security feature introduced in Windows Vista (it is also common in other operating systems) that causes that locations of executables/libraries/stack/heap in the memory are selected randomly. For example it minimizes a chance to perform a successful buffer-overflow attack. ASLR is not turned on for all programs but only for these that are ASLR-compatible. It is controlled by a linker option /DYNAMICBASE besides it can be enabled/disabled by editbin tool. By default this flag is set to ON in Visual Studio. The good information is that ASLR has been supported by ngen since .NET 3.5 SP1. Another recommendation says that in order to allocate memory VirtualAlloc method should be used instead of HeapAlloc because the later can bypass ASLR (for details see also this article). I asked a question on Stack Overflow how it is implemented in .NET and the answer is that .NET uses VirtualAlloc. However, my understanding is that we shouldn't be worried because CLR effectively provides its own ASLR. DEP (Data Execution Prevention) is another security feature that doesn't allow one to execute areas of memory that are marked as not-executable. i.e. they contain data and not code. Similarly to ASLR there is a linker flag /NXCOMPACT that enable/disable this feature and it has been used in .NET framework since .NET 2.0 SP1. It is also worth mentioning that in practise NXCOMPACT affects only 32 bit processes. 64bit process always use DEP and it is not possible to disable it (see also this article or this article). As to 32bit processes, I heard the recommendation to explicitly call SetProcessDEPPolicy function at the beginning of 32bit program (also in .NET) to assure that DEP will be used. Everybody knows what are events and delegates in .NET and we use them everyday. The equivalent of delegates in C/C++ are function pointers. I was really surprised when I read that it is not recommended to use them directly, for example as callbacks. Instead, they should obfuscated and de-obfuscated when needed by using EncodePointer/DecodePointer functions. It is a concept somehow similar to ASRL. The goal of this technique is to make it difficult to predict a pointer value and override it so that it will point some malicious code. I couldn't find information if .NET uses these functions internally so I asked a question on Stack Overflow. The answer is that probably .NET doesn't use them.. Simplifying, structured exceptions are exceptions on the operating system level. Every structured exception has a handler that is executed when the exception occurs. It is important that it is potentially possible to override an address of this handler and perform an attack. Safe SEH is a security mechanism that doesn't allow one to do so by providing a table of possible handlers. It is controlled via /SAFESEH linker flag but again it does matter only for 32 bit processes. It seems to me that .NET doesn't use this flag because I found this flag disabled in the make file of Core CLR. However, one of guys who answered my question on Stack Overflow says that .NET uses a table lookup for exception handlers, not pointers on the stack, what gives the same result as SAFESEH. I think that you must have heard about .NET Source Stepping feature in Visual Studio which allow a developer to debug .NET. It is a cool thing but my experience shows that it sometimes works and sometimes not. I think that it happens because Visual Studio can have problems to download appropriate version of symbols from Microsoft Symbol Server. However, recenly I've figured out that it can be done in a different way i.e. we can use the free .NET decompiler dotPeek from JetBrains. To be honest I've been using dotPeek since .NET Reflector is not free and it works great but for a long time I wasn't aware that dotPeek can play a role of a symbol server. When I told about this to my friends they were also surprised (in a positive way) so here is a short How-to. Start and configure Visual Studio. Now Visual Studio will be trying to download symbols and source code from dotPeek. 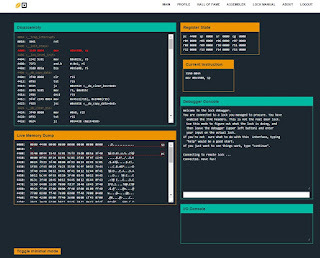 dotPeek will be generating them (symbols and source code) in flight by decompiling assemblies . 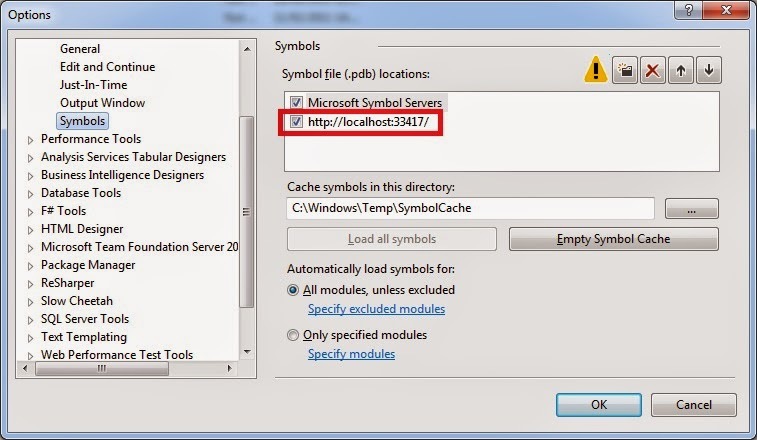 Visual Studio caches symbols on the disk so dotPeek doesn't have to be running all the time. It is worth mentioning that you can set a breakpoint in decompiled source code! If for some reasons Visual Studio will not download symbols from dotPeek you can enforce this from Modules or Call Stack windows in Visual Studio. To do so select Load Symbols command from the context menu. You have to remember about one drawback. If you enable external symbol server in Visual Studio it may cause that starting a debugging session will take considerable longer time because IDE will try to download symbols for all assemblies. Ostatnio spotkałem się z taka sytuacją. Ktoś zdefiniował sobie dość specyficzny format daty na swoje potrzebny. Wszystko było ok kiedy był on używany do zamiany typu DateTime na ciąg znaków. Problemy zaczęły się przy próbie wykonania operacji odwrotnej. Okazało się, że rodzina metod DateTime. (Try)Parse sobie z tym nie radzi. Rozwiązaniem okazało się użycie metod z rodziny DateTime. (Try)ParseExact, która od tych wcześniejszych różni się tym, że jawnie wymaga podania formatu, który ma zostać użyty przy parsowaniu. If you parse a date and time string generated for a custom culture, use the ParseExact method instead of the Parse method to improve the probability that the parse operation will succeed. A custom culture date and time string can be complicated, and therefore difficult to parse. The Parse method attempts to parse a string with several implicit parse patterns, all of which might fail. Jeśli używamy własnych formatów daty i czasu to zaleca się użycie DateTime.(Try)ParseExact. 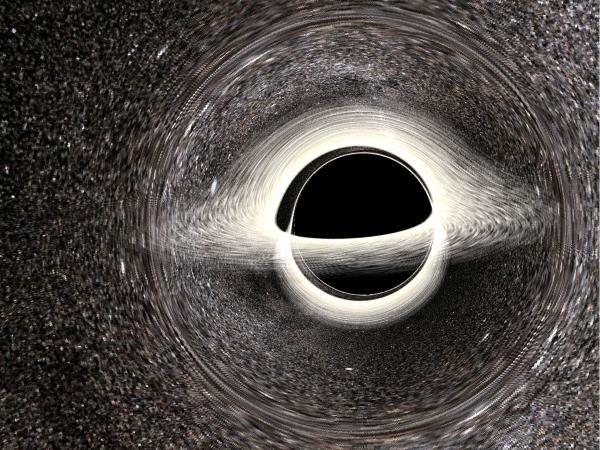 Kolega podesłał mi link do ciekawego artykułu na temat 10 zasad stosowanych w NASA, aby pisać naprawdę bezpieczny, czytelny i dobry kod. Zasady te w oryginale dotyczą języka C i zacząłem się zastanawiać czy da się je zastosować do .NET'a. Na zielono zaznaczyłem te zasady, które moim zdaniem da się użyć w .NET'cie, na pomarańczowo te dyskusyjne, a na czerwono takie, których się nie da. Stosuj tylko bardzo proste konstrukcje sterujące przepływem sterowania w programie. Nie używaj goto i rekursji. Mi ta zasada przypomina inną Keep it simple stupid, czyli nie starajmy się na siłę pokazać jakimi super programistami jesteśmy i piszmy możliwie prosto. To, że bez goto można się obejść to oczywiste. Bardzo dyskusyjny jest natomiast zakaz użycia rekursji. Autor zasady argumentuje to tym, że brak rekursji ułatwia pracę analizatorom kodu źródłowego, a także dowodzenie poprawności kodu. Ciężko mi z tym dyskutować, bo nie wiem jakiego analizatora używa NASA i nie spotkałem się też z dowodzeniem poprawności kodu w .NET. Osobiście uważam, że rekursja jest przydatna i w wielu przypadkach algorytmy zapisane rekurencyjnie są po prostu łatwiejszych do zrozumienia. Trzeba jednak uważać o czym już pisałem w tym albo w tym artykule. Wszystkie pętle powinny mieć sztywno określoną górną granicę liczby iteracji. Znowu dyskusyjna sprawa i znowu ma to służyć temu, aby można było udowodnić, że pętla się kiedyś zakończy. Dać się pewnie da tak pisać, ale wygodne to to pewnie nie jest. Ponieważ w .NET'ie nie piszemy oprogramowania dla statków kosmicznych tą zasadę bym pominął. Nie stosuj dynamicznej alokacji pamięci (w szczególności garbage collector'a) już po zainicjowaniu aplikacji. No cóż w .NET bez garbage collector'a się nie da. Można próbować minimalizować tworzenie nowych obiektów w czasie działania aplikacji, ale tak na co dzień to właściwie po co? To, co powinno się rozważyć, to załadowanie do pamięci danych niezmiennych (referencyjnych, słownikowych czy jak to zwał) i korzystanie z nich przez cały czas życia aplikacji. Metody powinny być możliwie krótkie tj. nie więcej niż 60 linii kodu. Czy 60 to dobre ograniczenie? Można dyskutować, ale z pewnością metody powinny być możliwie krótkie bo to podnosi ich czytelność. Po drugie jeśli metoda jest krótka to znaczy, że robi jedną konkretną rzecz, a nie kilka lub kilkanaście. Średnia liczba asercji na metodę powinna wynosić minimum 2. Asercje powinny zabezpieczać przez sytuacjami, które w ogóle nie powinny wystąpić i nie mieć efektów ubocznych. Co do tego jak pisać asercje to się zgadzam, ciężko mi natomiast powiedzieć, czy 2 to dobra średnia asercji na metodę. W komentarzu do tej zasady autor pisze, że przeciętnie testy jednostkowe wykrywają 1 błąd na 10-100 linii kodu, a asercje jeszcze zwiększają szansę na wykrycie błędów. Ja to rozumiem tak, że sugeruje się używanie tego i tego. Ok, ale ja bym jednak explicite wspomniał potrzebę testów jednostkowych czy ogólnie testów automatycznych w tej zasadzie. Zmienne powinny mieć możliwe mały zasięg. Czyli nie stosujemy globalnego stanu, nie re-używamy tej samej zmiennej do różnych celów itd. Wyniki zwracane przez metody powinny być zawsze sprawdzane przez metodę wołającą. Każda wołana metoda powinna zawsze sprawdzać parametry wejściowe. Innymi słowy nie ufamy nikomu, nie stosujemy konwencji (na przykład takiej, że jeśli metoda zwraca kolekcję to nigdy nie zwróci null'a, ale pustą kolekcję) itp. Ja jednak lubię konwencję, a parametry wejściowe staram się weryfikować głównie dla metod publicznych i chronionych. Wyniki zwracane przez metody weryfikuję natomiast przede wszystkim przy użyciu zewnętrznych bibliotek. Należy ograniczyć użycie pre-procesora, makr i kompilacji warunkowej. Preprocesora i makr nie mamy w .NET, ale możliwość kompilacji warunkowej już tak. Czemu ich nie używać? Ponieważ utrudniają przewidzenie wyniku kompilacji. Autor zasady podaje taki przykład. Załóżmy, że w programie mamy 10 dyrektyw kompilacji warunkowej. Załóżmy, że używają innych warunków. Daje 2^10 = 1024 różnych możliwych wyników kompilacji tego samego kodu, które mogą działać inaczej! Należy ograniczyć użycie wskaźników. W szczególności stosujemy co najwyżej jeden poziom dereferencji. Wskaźniki na funkcje nie są dozwolone. Autor ponownie argumentuje, że brak wskaźników ułatwia weryfikację kodu. Tą zasadę ciężko jednak przełożyć na .NET. Niby z typowych wskaźników też można korzystać, ale nie jest to często używane. Jeśli natomiast pod słowo ''wskaźnik'' w tej regule podstawimy ''referencja'', a pod ''wskaźnik na funkcję'' terminy ''delegat'' lub ''wyrażenia lambda'' to okaże się, że w .NET nie możemy zrobić właściwie nic. Podsumowując ta zasada nie ma zastosowania do .NET'a. Kod musi się kompilować i to bez ostrzeżeń. Przynajmniej raz dziennie kod źródłowy musi przejść weryfikację przy pomocy narzędzi do statycznej analizy kodu z zerową liczbą ostrzeżeń. To, że kod musi się kompilować to oczywiste. Jeśli chodzi o ostrzeżenia to moim zdaniem w przypadku projektów prowadzonych od zera liczba ostrzeżeń rzeczywiście powinna być równa 0. Jeśli uważamy, że jakieś ostrzeżenia są "głupie" to trzeba odpowiedzieć sobie na pytanie czy używamy dobrych narzędzi? W przypadku tzw. kodu zastanego sprawa jest trudniejsza, ale te 10 zasad służy m.in. właśnie temu, aby nie tworzyć takiego kodu. Jak widać nie wszystkie z tych zasad da się zastosować w .NET czy przy tworzeniu aplikacji typowo biznesowych. Z drugiej strony są firmy, które w .NET piszą oprogramowanie medyczne. Niektóre z tych zasad wydają się bardzo drakońskie, ale jak już pisałem NASA w swoich projektach osiąga wynik 0 błędów na tysiąc linii produkcyjnego kodu. Polecam też zapoznanie się z oryginalnym dokumentem NASA’s 10 rules for developing safety-critical code. Czy sposób pisania pętli for ma wpływ na wydajność? Dla rzetelności testy uruchomiłem wielokrotnie. Czas wykonywania obliczeń w obu przypadkach wynosił około 320ms z dokładnością do kilku milisekund. Czasami pierwsze podejście było szybsze, a czasami drugie. Z jednej strony czegoś takiego się spodziewałem. Z drugiej strony sądziłem, że jednak zaobserwuję pewien zysk w drugim przypadku. Dlaczego? Otóż jeśli spojrzymy na kod pośredni wygenerowany przez kompilator to te dwie implementacje bynajmniej nie są identyczne. W pierwszym przypadku długość tablicy odczytywana jest wielokrotnie na koniec pętli, a w drugim tylko raz przed właściwą pętlą. Najwidoczniej jest to jednak tak szybka operacja, że się nie liczy (w IL do odczytania długości jednowymiarowej tablicy istnieje dedykowana instrukcja ldlen). Dodatkowo przeprowadziłem podobny test dla użycia listy generycznej List<T>. 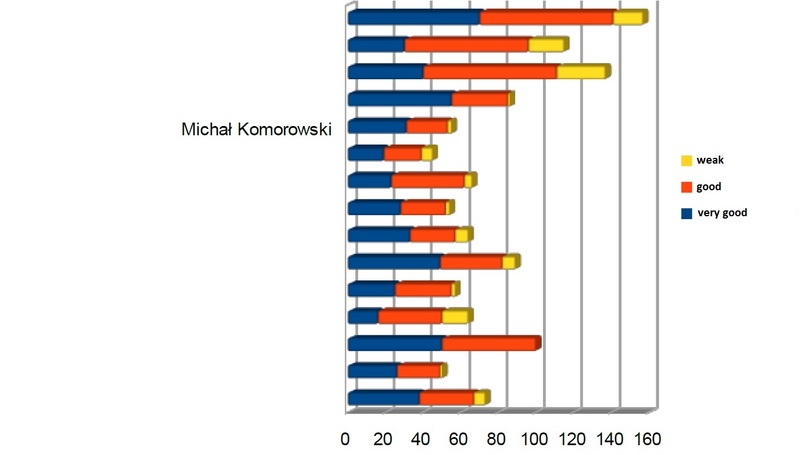 Tym razem różnice były już zauważalne i wynosiły około 27% na rzecz zapamiętania liczby elementów listy w dodatkowej zmiennej. Średnio pierwsza wersja wykonywała się 957ms, a druga 752ms. Wynika to z tego, że aby odczytać liczbę elementów w liście należy odczytać właściwość Count czyli metodę get_Count. Na poziomie IL jest to robione przy pomocy instrukcji callvirt (w telegraficznym skrócie służącej do wołania metod na rzecz obiektów), a nie dedykowanej (i pewnie zoptymalizowanej) instrukcji ldlen jak ma to miejsce w przypadku tablic. Pomimo tych różnic uważam jednak, że w codziennej praktyce programistycznej nie należy się tym przejmować gdyż różnice w czasach obliczeń, w porównaniu do dużej liczby iteracji (100000), są zbyt małe.